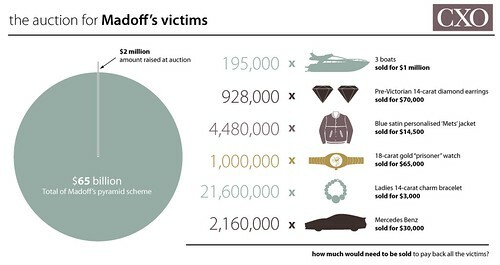 When Bernie Madoff was arrested, it was revealed he had been running the largest pyramid scheme, i.e. scam, in US history. His Ponzi scheme defrauded thousands of investors and netted Madoff an approximate US$65 billion. Unsurprisingly, some people want their money back, so an auction of some of his luxury items has begun in the US, with US$2 million already raised.